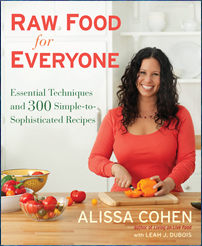 Raw Food For Everyone is a recipe book written by Alissa Cohen, accomplished raw food chef, teacher and owner of the Grezzo restaurants in Boston and Newburyport. In this book Cohen offers readers a bountiful selection of recipes, a primer of raw food preparation methods, and a comprehensive guide to the ingredients that are used in raw food cuisine. Cohen says that her goal in writing this book was to change the thinking that a raw food diet is restrictive or boring. She wants everyone to know that raw foods are not just healthy and energizing but they can also be exciting and delicious. At the beginning of the book she commences by explaining the benefits of eating a raw food diet and offers tips on how to get started. Cohen suggests setting a goal of 30, 60 or 90 days raw, preparing your foods in advance to make meals simpler and experimenting with different flavors. She also includes basic information on the nutritional components of raw foods and explains the process of detoxification. Additionally she addresses some of the challenges that may arise when you start eating raw foods and offers tips and advice for overcoming them. Following this is a description of raw ingredients, kitchen equipment and instructions for soaking and sprouting. There are 300 raw food recipes included in the book with categories including raw cheese, pickles, smoothies, breakfast, appetizers, crackers and wraps, salads, soups, main courses, cocktails, and desserts. Some of the recipes in the book include: Nacho Cheese, Pickled Pink Onions, Chocolate Malt Shake, Granola, Lobster Mushroom Salad, Broccoli Soup, Hawaiian Pizza, Bistro Burgers, Angel Food Cake, New York Style Cheesecake and Rum Raisin-Pistachio Ice Cream. Also included are ideas for fifty different smoothies and fifty basic salad combinations. Fruit, vegetables, sprouts, sea vegetables, flaxseeds, sunflower seeds, hemp seeds, chia seeds, almonds, walnuts, pecans, cashews, buckwheat, oat groats, avocado, coconut, olives, fresh herbs, sparkling wine, sake, agave, raw cacao, vanilla beans, blue green algae, nama shoyu, extra virgin olive oil. This book just contains raw food recipes, therefore, does not include exercise recommendations. Raw Food for Everyone: Essential Techniques and 300 Simple-to-Sophisticated Recipes retails at $35. Encourages the intake of a high amount of fresh produce. Includes information on the nutritional value of raw foods. Provides detailed instructions on soaking and sprouting. Offers a wide variety of gourmet recipes for the raw vegan diet. Will probably be overwhelming for those new to the raw food diet. Many of the recipes require the use of a food dehydrator. A lot of the recipes are complicated and very time consuming to prepare. Some of the recipes, especially the desserts, are high in fat and calories. Raw Food For Everyone includes basic information on getting started with a raw food diet, as well as a wide selection of gourmet raw food recipes. This book does contain some basic raw food recipes, however on the whole this book is impractical for daily use due to the complicated nature of many of the recipes as well as the amount of time required to prepare them.